Discover the exciting world of paint pouring with award-winning artist, painter and teacher Jackie Peach these summer school holidays. No drawing skills are required and children can engage with their natural creative instincts whilst learning this fluid painting style. This versatile technique involves mixing the paints in jars with water and then literally pouring them onto the canvas. Children are encouraged to experiment with colours and layers to create beautiful landscapes. This method is a wonderful tool for building self confidence as it's impossible to make a mistake. Each child's paintings are truly unique. 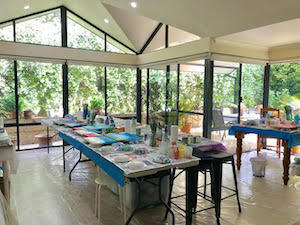 Jackie is often amazed by what children can create - she notes that the biggest thrill for her is "seeing their faces beaming at the end of the workshop." The interactive workshops are presented in a welcoming and encouraging atmosphere and Jackie will be on hand to offer one to one guidance and support if needed. Children will walk away with three one of a kind artworks to proudly display at home or gift to loved ones. These fun-filled workshops are suitable for ages 9 and over as it does require some patience. There is a maximum of 5 children per workshop and all required materials are supplied. 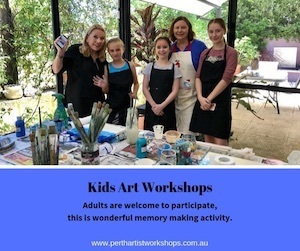 Adults are welcome to participate, it's a very special memory making workshop. If your child loves to get crafty - make sure to book them in for this unique school holiday activity. The cost is $95 per person, per 2-hour workshop and includes 3 canvases and all required materials. 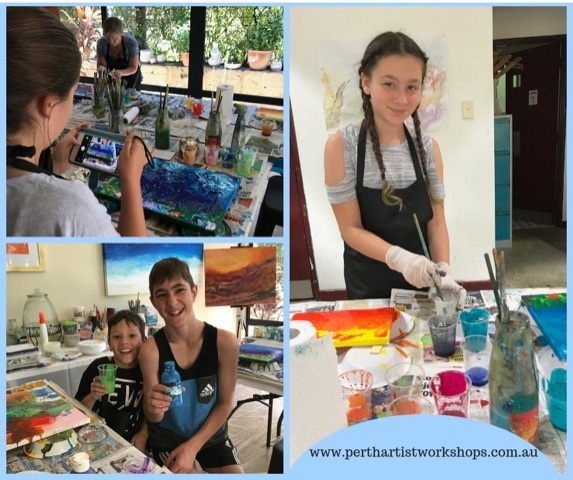 If you are keen to attend this workshop with your child, Jackie is happy to host a parent/son & daughter class - simply contact 0404 987 424 or email jaclyn191@optusnet.com.au for more information.